The history of Fernhill Park and the Tourist Cabins have remained above the fold for five months now as a busy and enjoyable summer has played out in real time away from cyberspace. 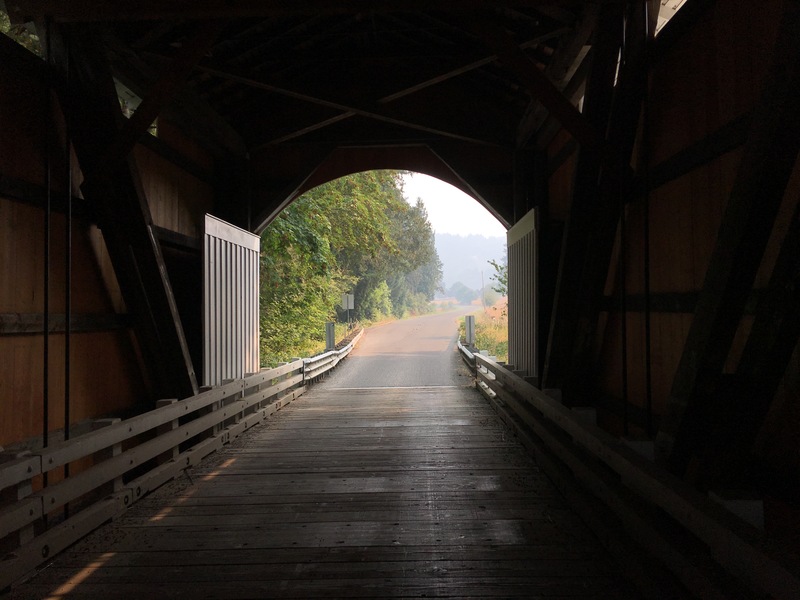 But even while in a kayak or on a bicycle (as above at the Mosby Creek covered bridge, east of Cottage Grove on the Row River Trail), I’m always a student of the connection between then and now, past and present. Windows, old and new. The eyes and defining character of our old homes and buildings. Tear downs and new construction. This is a big one, reshaping our neighborhood landscape in so many ways. We need to stand back and look at the big picture of change even as we examine the loss of specific homes and family memories. Alleys and street layout. Why do some neighborhoods have alleys and some don’t? The rest of the story on things I’ve already written about. There’s a lot here on the blog: 160 posts over the last 10 years covering a wide range of topics. Use the search bar above on the left or the category listing on the right to explore what’s here. Have an idea or a topic~place you’d like to learn more about? Drop me a line. Thanks to AH readers who’ve reached out this fall to make sure the lights are still on here in this old house. Sure enough. 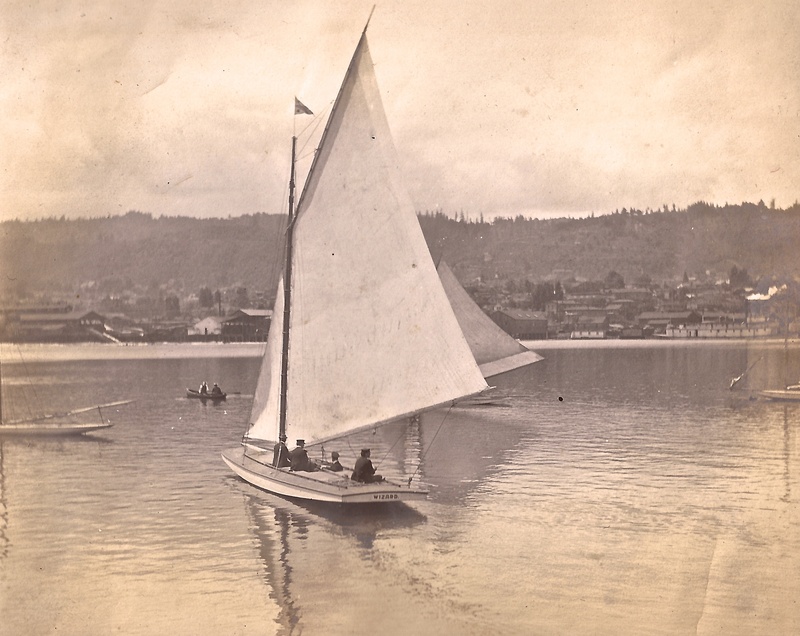 This 1900s view of Portland Harbor from the east bank of the Willamette River in the vicinity of today’s Memorial Coliseum is from the precious scrapbook of family photos shared with us by Laurelhurst resident Bob Elston. You’ll recall the photos Bob shared last year, which led us into a reconstruction of 1900s life near the corner of NE 3rd and Broadway where his family grew up, and then into a deep dive to explore the history of the eastside gulches. It’s amazing where a few pictures can take us (we’re always looking for photos of the neighborhood and old houses, so go have a look at that box in the attic). Check out the name of this boat setting sail from the east bank, and click around to look at the details on the west bank as well. It’s been a quiet spell here on the AH blog. My history work is avocation and passion, but I have a real job too, which has always come first, with history research and writing relegated to what’s left over after a more than full-time commitment of time and energy. This fall, I’ll be transitioning away from that commitment and shifting into a new chapter with a totally different role and pace. When that happens, the subjects of exploration here on the blog—and a desire to further engage with helping connect past and present—move into first position. The result: more blog activity and insights into the stories of our old houses and neighborhoods; maybe a new branch or two of inquiry; a ramp-up in my ability to take on and complete individual house and building history requests; other ideas? Thanks for following along on the journey these last nine years, for the ideas and photos you’ve shared. Looking forward to expanding the Alameda History conversation here in this next chapter. Stay tuned for a new look! In the life of an old house, we know it’s important to renovate, refine, upkeep and maintain or things start to fall apart, or at least not work so well. This week, as we’ve begun to make a few improvements to the look and function of Alameda Old House History, we have learned the blog design framework we’re using is no longer supported. Uh oh. We’ve also been thinking for some time that it might be nice to use more of the visual page here on screen, and to continue to broaden the community of interest in connecting past and present in old homes, buildings and neighborhoods. So for 2016, a few changes. First, a fresh look that we’ll be rolling out in the next day or so. Nothing fancy, it’s in keeping with our overall tone and style and we think it’s an improvement. Some things will look familiar, all of our existing content will move over, and you’ll be able to find your way around. Stay tuned, and let us know what you think. Second, we’ve linked the site to a Facebook presence. One of our goals with the blog has always been to get more people appreciating and hooked on the history of their homes, neighborhoods and old buildings. Click the Facebook like button on the sidebar and share with your friends. We’ll start the new year with a great piece we’ve found in The Oregonian from 1929 about the soul of an old house. You’ll like it. And then we’ll wrap up the Beaumont photo series with one last great photo before moving into a list of topics for the year ahead including demolitions, the Alameda stairs, more on local mom-and-pop stores, a bunch of then-and-now paired photos and others. Any suggestions or things you’d like to see here? Neighborhood history mysteries to explore? Old photos or documents we should see? Thanks for being along with us on the history ride, and Happy New Year. It’s been quiet here on the blog lately because we’ve been busy working on several studies of homes and businesses in northeast Portland. Each time we do a study—which involves becoming immersed in documents, maps, photos, archives, and family stories—we focus in on connecting past and present, which is what this work is all about. These connections allow generations of owners—the people who have lived in, shaped and loved these buildings—to listen to each other, to learn, and sometimes to nod their heads in common understanding and amazement. What an honor and privilege to be able to help make those connections, to learn those stories and to understand and visualize the passage of time. And each time we take on a project, we learn more about the neighborhood as a whole. As we’ve zeroed in on this work in the last month (to the exclusion of the blog), it has occurred to us what we’re really doing is taking a hold of time that has already passed and trying to slow it down long enough to look around inside for understanding and for answers. Frequently, that’s what we get. Sometimes we just get more questions. With the completion of this latest handful of studies, we’re going to have some room to focus on some new (old) projects and studies. Interested? So let’s just think about the new @alamedahistory Twitter account simply as a way to expand the old house history conversation and flow of information. We’re not big into social media here, but we do like the idea of being able to exchange ideas, photos and access to knowledge and information. Frequently, when on foot in the neighborhood or elsewhere when old buildings are involved, we’ll see something of interest and take a picture, or wonder about a clue from the past. And just like you, we run into thought-provoking information on blogs and websites we might like to share. Now that we have been coached that Twitter is perfect for sharing these kinds of things—and understand it a bit better (ask a young person)—we’re ready to give it a try, as an experiment really. Maybe it will even spur us on to more frequent postings here. Let’s see how it works. You can follow us now by clicking the Twitter button on the right side of this page, or by looking us up on Twitter @alamedahistory. We’ve also arranged the blog page here so you can actually see our most recent tweets over there along the right hand side. Scroll down a bit and you’ll see it. If our tweet has a photo, you’ll see that too. We’ll try to share a few things every week, including what we’re working on next for the blog, and maybe a picture or two. Welcoming any feedback as we evaluate this new angle. But don’t worry, we won’t abandon the blog for Twitter. We’re here to stay. You’ll find the information on Elwood Wiles here. More about the Broadway Streetcar here. A collection of stories about people who are living in the houses where they grew up is here. The remarkable tale of the Pearson Ponderosa Pine is here. Have a good poke around the blog: there’s lots to read and you’ll find topics not just about Alameda, but Beaumont-Wilshire, Rose City Park and Albina too. And if you’d like a little more on neighborhood history, come along to the program I’m doing at the Archtectural Heritage Center on the morning of Saturday, January 23rd. Of course, I’m always on the lookout for an old photo, a mystery to solve or a neighborhood or old house story to listen to, so leave a comment here on the blog or drop me a note at doug@alamedahistory.org And if you’d like some help investigating the history of your own house, check out the research services and resources tab. Today I’ve added a new section to the Alameda History website that provides a focus on the builders. Look up above and to the right and you’ll see the word “The Builders.” From there you can click into a sub-page that provides links off into biographies I’m writing about the men and women who shaped our neighborhood landscape. I’ve started out with three builders I am very familiar with, but soon there will be more. Fans of houses built by Ken Birkemeier will be glad to know I’ve made contact with his family and will have lots to share soon, including early photos of some houses and a complete listing of Birkemeier houses in the neighborhood. My goal in focusing on the builders is to pay tribute to them, to take account of and remember their work, and to create an interest, appreciation and curiosity about the homes we all live in. I’m pleased and a little amazed to note that the Alameda Old House History Blog has just made it to 20,000 visits. I’ve been running the blog for about a year now and have enjoyed the comments and the conversation this forum has produced. It’s also nice to have an outlet for research, and to imagine a small but loyal readership that cares about this stuff too. Thanks for being along on the journey. I hope this work has stoked your imagination and curiosity about house history. The number one most viewed page is the style points piece on the Tudor Cottage. I guess that means there are lots of Tudor cottages out there in the world. The second most popular spot on the blog is the story on Alameda Life 1920-1930 which tries to imagine life here based on what the Federal Censuses offer. The busiest day for traffic on the site was December 8, 2007. On that day, the blog was mentioned by Jack Bogdanski at www.bojack.org (which is an interesting blog, by the way). Typically, the site sees about 70-100 visits a day. Daily visits tend to peak up into the hundreds immediately after the Alameda Newsletter is distributed (I write a history column in that newsletter and pick up some readers from there). The two quietest days of the year: Christmas and election day! I’ve just changed the domain name to make life a little simpler. Maybe you noticed: it’s www.alamedahistory.org The former URL works too, but it’s a mouthful to say. I’ll continue to share some of the material I’ve gleaned from reading all the old newspapers. I’ll upload stories, graphics, photos, advertisements and other tidbits. I’ve just started the process of nominating my home for listing on the National Register of Historic Places. I’ll write about that process and offer insight into its twists and turns as they unfold. I’m going to try to focus on interpretation that you can use. Places where I can point you in the neighborhoods as entry points for learning about history. I’ve tried to do this with the history walks, but will continue to seek ways to do this. Open to ideas. To those who have commented or pointed me in search of history, I say “thank you.” To all visitors, I invite you to contribute your thoughts, ideas and questions. Thanks for visiting this site, which is a place to share knowledge, tools and observations on appreciating the life of old houses. Specific pages dwell on particular topics relating to the history of the Alameda neighborhood in Northeast Portland. Other pages provide information on researching the history of your home. The idea is to create a conversation about how old houses (and their neighborhoods) have been shaped by the families who have lived in and loved them for generations, and how our houses in turn have shaped our lives. Alameda Stories introduces you to particular aspects of life in the early neighborhood. Research Services describes how an experienced researcher and writer can help unlock your home’s stories. Alameda Street Names describes the origin of street names we know today. Resources will help you learn more about how to search out the history of your home by yourself. The Map provides a look at the neighborhood as it was originally platted. Can you find your lot?